A real rarity is the "green gold", in the south of Styria, which is obtained from the first pressing of peelless pumpkin seeds. These pumpkins are already a peculiarity and only exist here. The "Protected Geographical Indication" (= pgi) seal of quality stands for the typical specialty from the secret inside of the pumpkins. 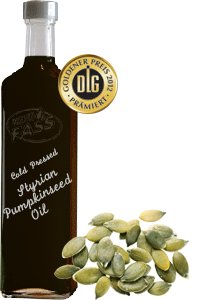 The seeds are a challenge to our suppliers, because only the best manufacturers manage to cold press them in a way that the oil maintains its natural character and special taste of the pumpkins. Suitable for the cold kitchen and for baking. It enhances muesli, salads or even boiled potatoes and is a real insider tip on vanilla ice cream!